After spending 15 years making beautiful-looking tales of human misery that critics over-praised but made little money, director Zhang Yimou switched gears. He followed in the footsteps of Ang Lee, another filmmaker whose dramas would not have anticipated Crouching Tiger, Hidden Dragon. So Zhang made Hero, starring Hong Kong superstars Jet Li, Tony Leung, and Maggie Cheung. It was a huge financial success compared to what Zhang was used to. Hero was also a pretty good movie, which can’t be said for his follow-up actioner, House of Flying Daggers. With Curse of the Golden Flower, Zhang goes to the well again coming up with something a lot more the quality of Flying Daggers than Hero. Curse has a cast calculated for profit in Asia. Eleven years after Shanghai Triad, Zhang reunites with Gong Li, lead actress for his first seven films and his one-time paramour. Just as Gong is the face of mainland Chinese cinema, Chow Yun Fat, more than any other actor, represents the height of Hong Kong cinema in the late 80s/early 90s. (Jackie Chan, another candidate, had simply been doing what he’s always done, albeit he was at his best during this period; Chow and the attitude he brought felt new). Finally, the third superstar is not a traditional actor at all but Taiwanese pop singer, Jay Chou. Taking place in 8th century China, Chow Yun Fat’s Emperor Ping is slowly poisoning his wife played by Gong Li. They have three sons. Prince Xiang (Liu Ye) is a milquetoast son to Ping from a previous wife. Prince Jia (Jay Chou) is a fierce, resolute warrior. Prince Cheng (Junjie Qin) is the youngest son who hides a secret ambition. The Empress shares an unhealthy love for step-son Xiang with Chan (Li Man), daughter of the court doctor. As intricate ties between the royal family and the family of the Emperor’s physician come to light, melodrama and tragedy abound. The first two thirds endlessly drags out the court intrigue, but the final third brings some welcome action and relief from the claustrophobic interiors. First off is a grand aerial attack by Chinese ninjas. They descend down mountainous cliffs on a web of ropes like human spiders. Then comes the central battle sequence, which might be Zhang Yimou trying to outdo Peter Jackson in action spectacle (he doesn’t). Two huge armies, one all in gold, the other in silver, clash in the center of the Emperor’s palace. Chow Yun Fat never quite seems comfortable here in the shoes of the villainous Ping. While he’s played the role of a killer aplenty, his character has always been redeemed by loyalty and compassion. Part of Chow’s appeal is that he always carries himself with some hint of essential decency whether he’s a blue collar undercover cop in City on Fire or martial arts master in Crouching Tiger, Hidden Dragon. The strange thing is that even hamstrung by this character, he’s more charismatic than anyone else in the movie while Gong Li is as cold and distant as ever. That actually helps the ending, which goes in an unexpected direction. In any case, the way Zhang films the whole thing makes character seem quite unessential. Tingxiao Huo has been responsible for the production design of all of Zhang’s recent incursions into the action genre from the open, relatively spare Hero to the intricately lush House of Flying Daggers. Here, he’s in the latter mode, but to the point of parody. Every stone, every piece of fabric, every pushed-up bosom is fetishized to ludicrous extremes. 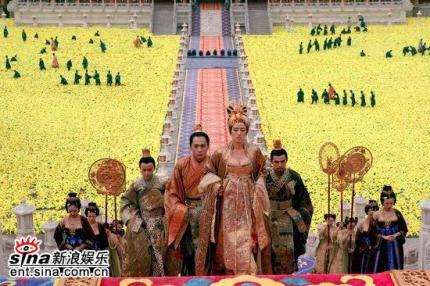 Zhang apparently wants to dazzle the eyes with the visuals, but Curse is one of the gaudiest looking movies ever made. If it’s not gold or silver, everything in the film comes in garish, rainbow hues. All the characters feel like chessboard pieces Zhang maneuvers about a board where his ultimate concern is the colors of the squares.